Hi everyone! Amylove here excited to share with you my first Helmar creation! When I received my product I was flooded with ideas!! I am always in need of pretty packaging so that is where I began. 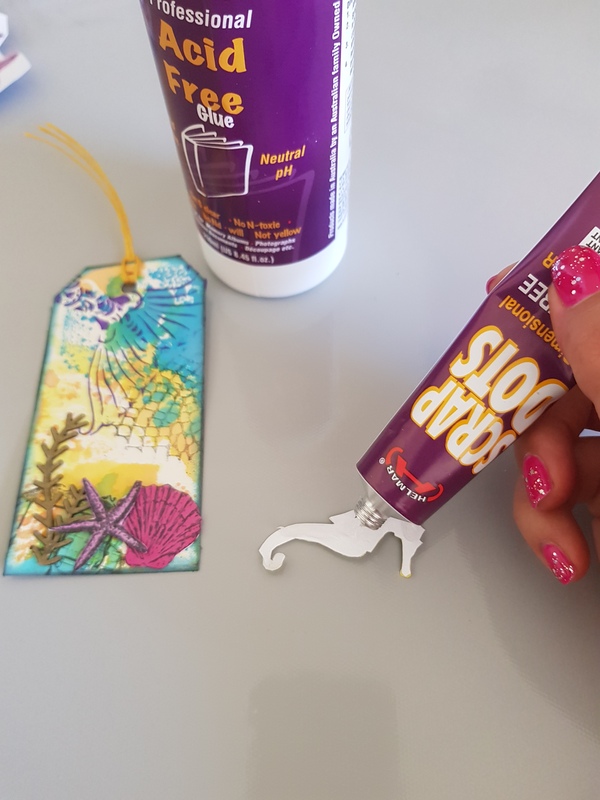 I was eager to see how well the Craft & Hobby PVA Glue would work for decoupage and it works amazingly!!! To prepare the napkins, I begin by separating the layers. I use a small paint brush dipped in water to outline the images I want to use and then gently tear out image from napkin. This gives the edges a softer look and allows the image edges to more easily blend in to the project. Due to the delicate napkin and the amazing consistency of the glue, I diluted the glue just a bit. I used the ratio of 4 parts glue to 1 part water. I applied the diluted glue to the bag with a paint brush, only adding the glue where I want to adhere the image. I lay the image over the glue and then wrap my finger in plastic wrap to smooth out the image. I then add the diluted glue over the top of the image working from the middle out. The bags turned out beautifully and make the perfect pretty packaging! Hello Everyone!! Farrel here and today I get to share with you all my first creation for Helmar! 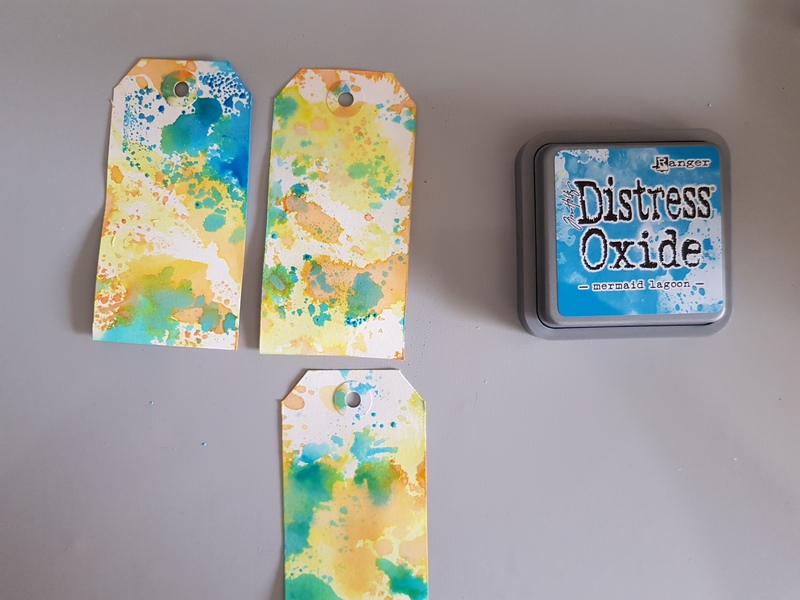 I recently just got back from an awesome Scrapbooking/Crafting cruise and one of the teachers wanted to do a tag swap. So I thought what better way to showcase Helmar than to use their products on the tags. 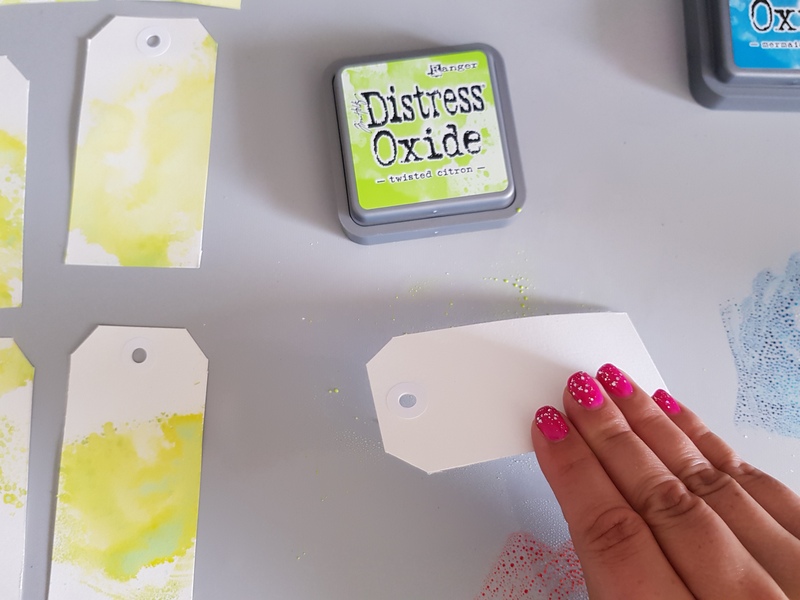 I started by covering the tags with Distress Oxides Twisted Citron, Spiced Marmalade and Mermaid Lagoon. 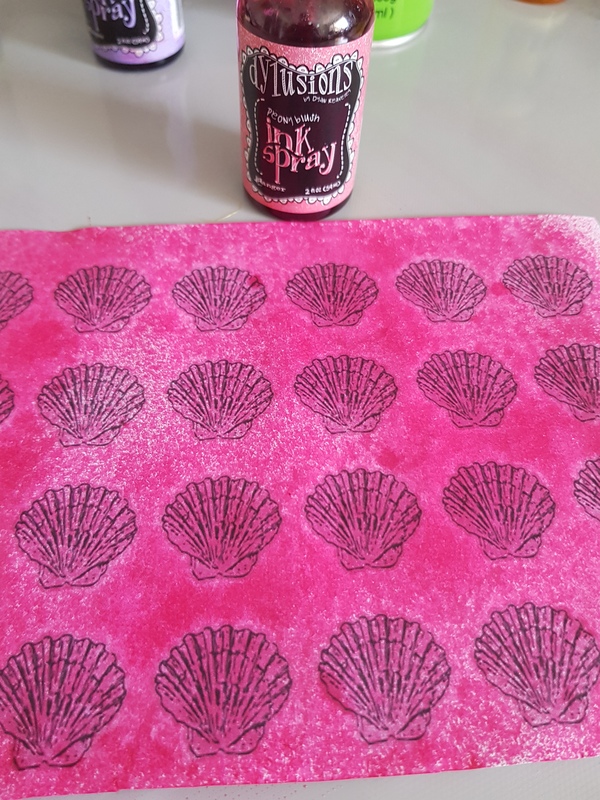 I stamped the ink pads onto my non stick craft mat and sprayed with water. 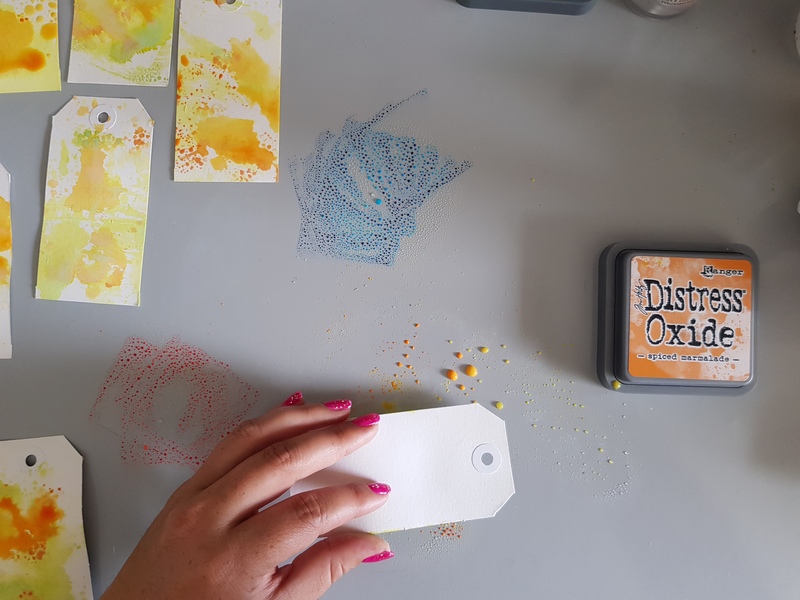 Then I randomly stamped the tags onto the inks, drying in between each colour. 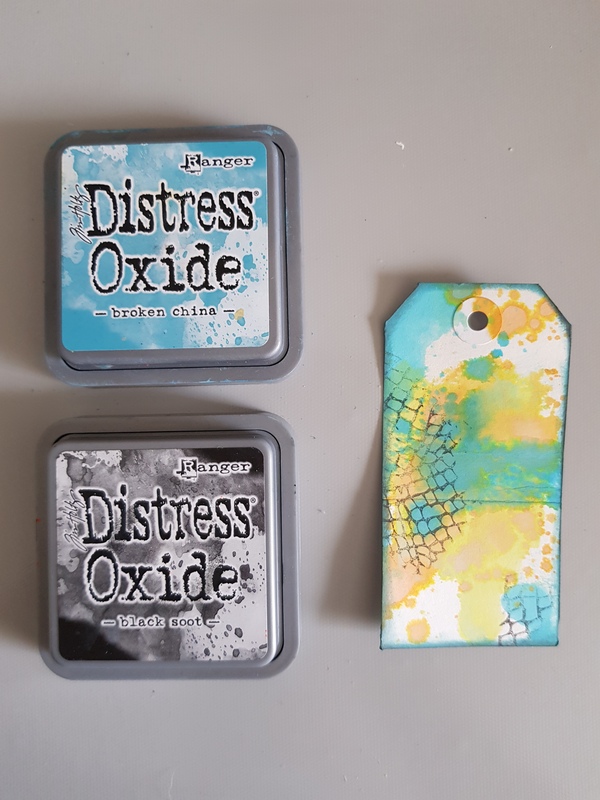 I also used my Distress Oxides to ink around the edges of the tags. I used Broken China first and then very lightly added Black Soot. 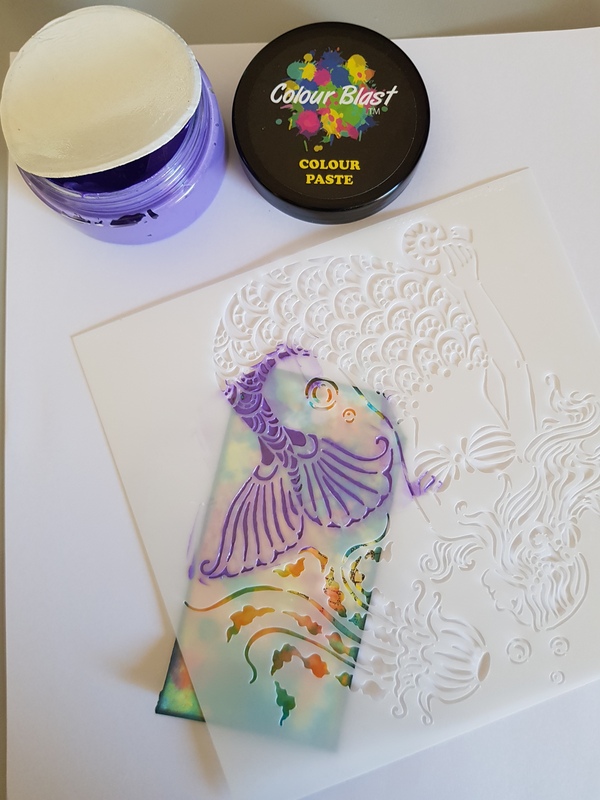 The theme for the tags was Fun at Sea and for me mermaids are fun, so I used TCW783 Mermaid Dreams in the 6x6 with Colour Blast Colour Paste Royalty. I only used the mermaids tail on the tags. 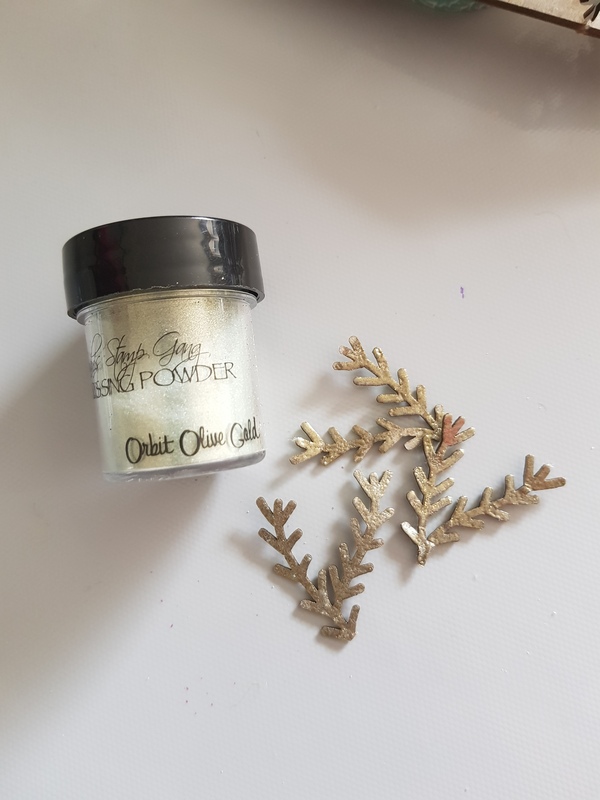 While that was drying I then heat embossed Foliage #11 by Dusty Attic chipboard with Lindy's Stamp Gang Embossing Powder Orbit Olive Gold. 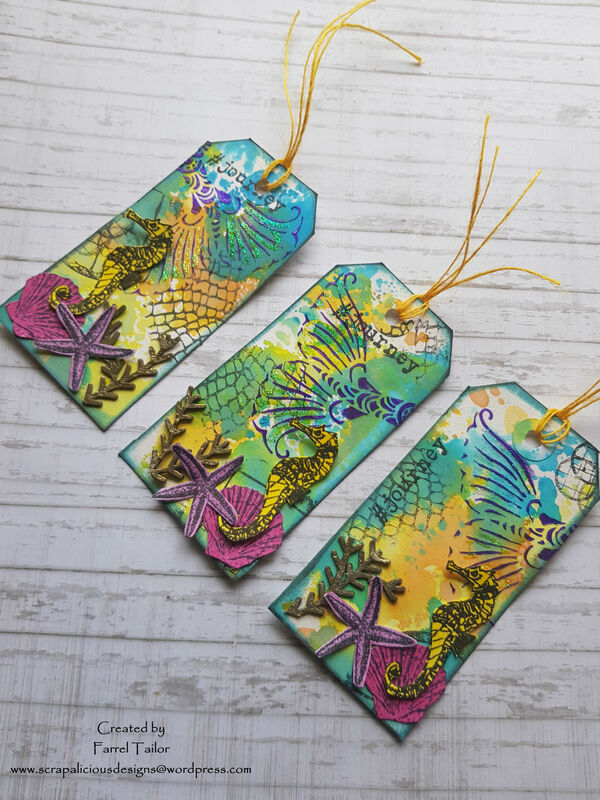 For my seahorse, starfish and shell, I stamped my images and then scanned them to make them small enough to fit on the tag and printed them out on regular copy paper. I then sprayed them with Dylusions Sprays - Lemon Zest, Peony Blush and Rose Quartz. I decided to adhere my sea creatures onto some cardstock for extra stability so I used Helmar Spray Adhesive to cover the cardstock and then placed the stamped images onto it before cutting them out. 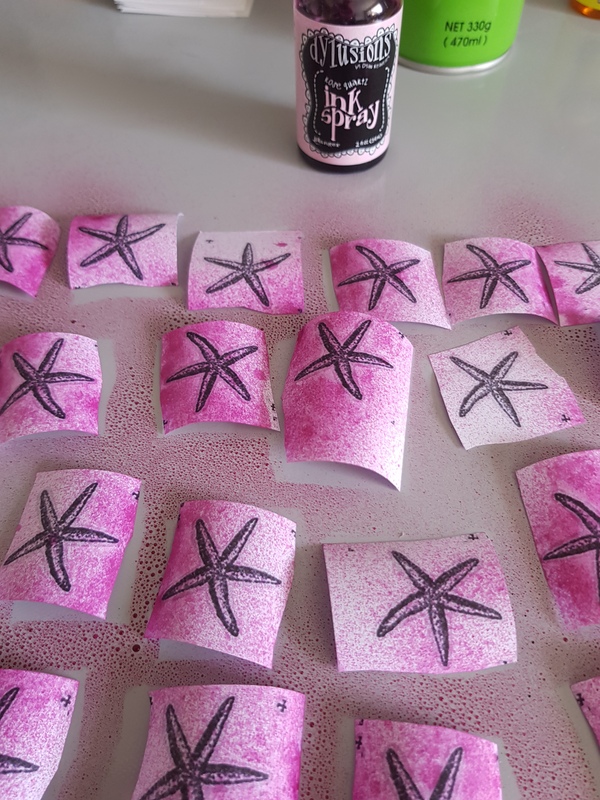 I then used Helmar Scrap Dots to adhere my Seahorses and Helmar Professional Acid Free Glue to adhere the starfish and seashell. To finish off the tags, I also added some Kindy Glitz to the mermaids tail. I hope you have enjoyed my tutorial and I can't wait to share my next project with you soon. Who are ANZACs? ANZACs are men and women of the Australian and New Zealand Army. On April 25th each year, events are held all over the country to remember the sacrifices of those who served and their families. I have ideas of how things go on this day for so many people, so please allow me to tell a story. While the story is made up for me.. I am sure there is someone out there who can possibly relate. Here is the project I created..
Each year a group of ladies come to our restaurant for a tea. They come on ANZAC Day. I am sure they are a group of wives of servicemen who have in fact passed on. I was told that while their husbands were away, they committed to gather on this day and reminisce. So I on this day I left a decorated basket on their the table with a few ANZAC personal touches and vintage keepsakes. I wanted them to know.. We as civilians honored not only their spouses, but also the families, who sacrificed for us all.. I began with making some over-sized poppies. I went and search for poppy patterns on google and pinterest and found one I liked. I printed it and because I knew I needed to use it multiple time.. I took the page and I added support to it by adhering it to cardstock with Helmar Super Tac . I cut out the shapes and placed them against the felt and cut them out.. I wish I had some straight pins to hold the pattern instead of my hands though. I later decided the felt was too floppy, so I brushed the edges with the Helmars Stiffener and Draping. That way as I curl the edges or shape the petals more they would have more body. If you own sheers, they cut the felt more precisely. If you own sheers, I think they cut felt more crisply. I pinched the petals of the flowers together with Helmars Fabric Glue and held them with a binder clip. Then also began layering the pieces and the Poppy came together nicely! I decided it wasn't enough and found some vintage photos on google. I printed them for the ladies to keep and made little note cards for the day! I hope you are encouraged to remember the servicemen and women and the their families not just today. They need our support and love and if all you can do is offer something handmade or a smile or words of gratitude we will all be on our way to making the world a better place.. Just don't forget all projects make awesome projects, when you're using Helmar Products!! Art journal page - When in doubt, wear red! Hello! I’m Robyn Wood, one of the new members of the Helmar Creative Team! I’m really looking forward to inspiring you in the coming months! For my first project, I’d like to share an art journal page that I’ve created in a very interesting type of journal. The Dina Wakley journal has a mix of page types - watercolour, craft, canvas & burlap. I thought it would be good to use a pair of my favourite adhesives and test out one that is new to me, Helmar Fabric Glue, as I’d like to see how it works with the burlap surface. Of course, you can use any surface you have available and I’ve given you some project alternatives at the end. N.B. Each stage of painting and gluing requires drying, either allow to dry naturally or carefully speed up the process with a heat gun. Tear a piece of sheet music to approx. 25cm wide by roughly the length of the skirt. 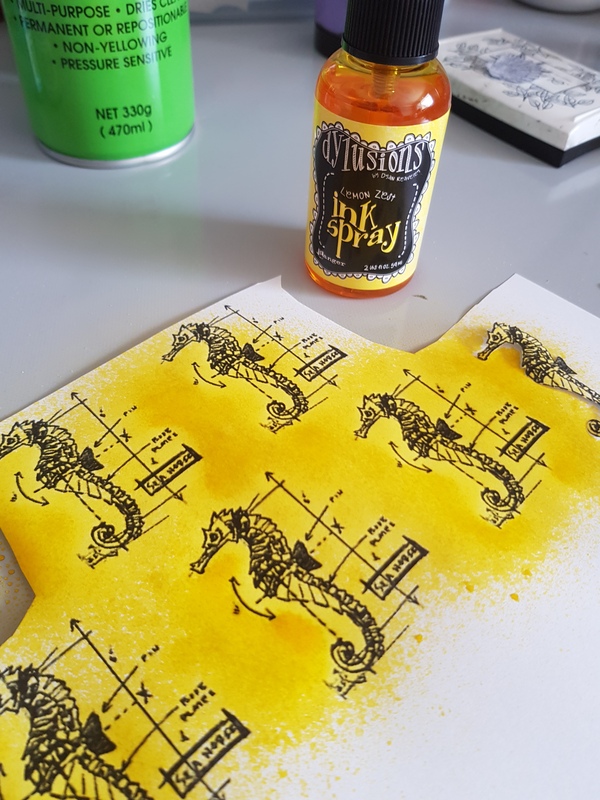 Spray sheet music with Heidi Swapp Colour Shine and while it is still wet, sprinkle parts of the paper with Lindy’s Stamp Gang Magicals. The red Magicals deepen the colour of the shimmer spray and adds patches of extra shine. Cover chipboard hearts with patterned paper using Helmar Professional Acid Free Glue. I find it perfect for covering chipboard shapes as it rarely wrinkles and dries quickly. Once dry, sponge edges with brown ink. Using scissors, cut chipboard bustier shape in half vertically. Paint chipboard dress mannequin and bustier with Prima metallic red paint, remembering to also paint the chipboard edges. Once bustier is dry, paint over with a thin layer of white Viva Crackling Colour. Allow to dry and punch with five small holes either side of the midline. With dress mannequin lying face up, place sheet music across the waistline and carefully gather the paper around the shape by alternately tucking and folding. Aim to have even folds radiating from the centre and the outside edges folded over. Level off the waistline by small tears if needed and check that the shape will fit its intended spot. Perhaps try on a sheet of scrap to practice first. Once the paper is folded to your liking, adhere to mannequin shape using Helmar 450 Quick Dry Adhesive. Adhere laced bustier using Helmar 450 Quick Dry Adhesive. It will need to sit so that it just covers the top of the torn paper skirt. Add some small pearls to the mannequin, just below the bustier. I always use Helmar 450 Quick Dry Adhesive to ensure they stay in place. Layer pattered paper shapes and paper doyley onto burlap art journal page so that they make an off-centre background layer for the dress mannequin. I have used a larger piece, approx. 13cm x 20cm and a smaller piece approx. 9cm x 13cm (right hand edge torn). But it will depend on the size of your page so alter to suit. Attach paper pieces using Helmar Fabric Glue. Protect the next page from bleed through of adhesive with some baking paper. (If your page is not burlap/fabric, then the usual Helmar 450 Quick Dry Adhesive will suit.) Adhere paper doyley. Attach mannequin to page using Helmar Fabric Glue. Attach both hearts and cheesecloth to the page using Helmar Fabric Glue. Off set them slightly for a bit of interest. Attach printed quote onto some scrap patterned paper using Helmar Professional Acid Free Glue. The quote is then attached over the two hearts and the author piece is attached to the bottom, right hand corner. I always like to include the author details where I can as a mark of respect. The final finish is a trio of clear gem stones attached to the edge of one of the hearts using Helmar 450 Quick Dry Adhesive. The burlap pages in the Dina Wakley art journal are a fabulous visual surface to work on, but they can be a little challenging to adhere elements to. The Helmar Fabric Glue came to the rescue! Happily, it had very little bleed through onto the next page and dried quickly with a strong bond. I hope you have enjoyed learning how to recreate this project. I think it would look perfect on a scrapbook page, large A5 sized card or on a canvas. The options are endless if you change out the colours and papers and perhaps add different embellishments. I look forward to sharing with you next time. Hi Everyone, I'm Suzanne and this is my first post as part of the new team I'm very excited to be sharing my first project with you! I started off with a canvas that I had layered plaster (like you use when you have a broken arm) roughly over it, once it dried I painted it with black gesso. 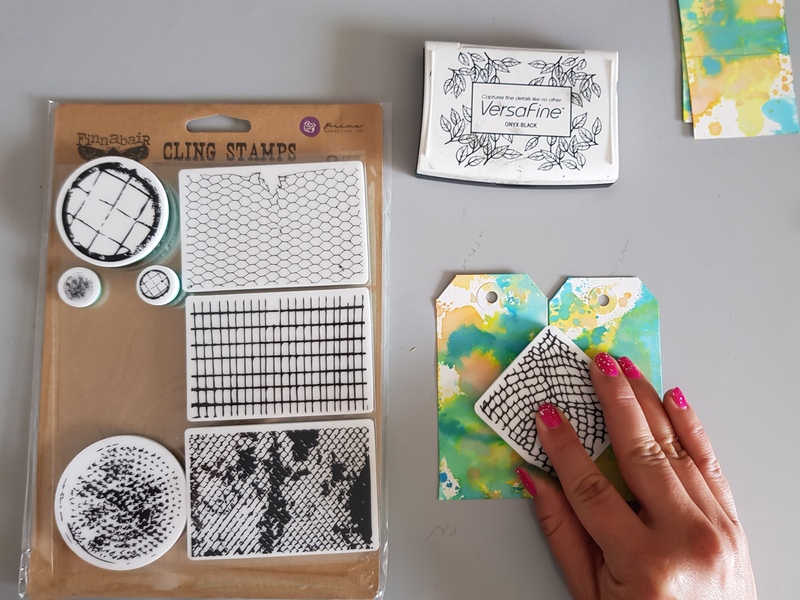 I then sprinkled a variety of Lindy's Stamp Gang Magical's to give a colourful background, I love the way they go into all the grooves and give you several colours in the one colour. I used the Helmar Gemstone Glue to adhere the little diamonds into the metal cabochon - it's great because it dries clear and they look like they were always there. These flowers are from Memory Maze and I painted them with some watercolour paints I had on hand. I used my favourite glue the Helmar 450 Quick Dry Adhesive for adhering everything to the canvas. Hi, Raelene sharing with you my first project with the Helmar Creative Team! I wanted to do something with my boys for Earth Day and decided I needed a mini album to record the memories in but I wanted it to be as environmentally friendly as possible so I decided a upcycled album was the way to go. I love making mini albums but haven't made one in a long time because no matter how high quality the tape is I use due to the climate here the stick gives way due to the weight so I have wanted to experiment with using Helmar Professional Acid Free Glue to create a mini album and it was not only easier to do but the hold is much stronger than the strongest tape I have used in the past. As there can be a variation in toilet roll sizes I have included instructions for getting the best sizing for your rolls. Flatten out your toilet rolls, you can do this with a iron, running them through a Big Shot or similar die cutting machine or with a bone folder and then put them under something heavy. Measure the inside measurement of your toilet rolls, cut a strip of Kraft cardstock slightly smaller, this will form your Hidden Hinge Binding. Cut 4 cover pieces to be long enough to cover your tags and slightly wider than your toilet rolls. Save your scraps you will use one of them for the outside of your binding but we will wait to cut this once the binding is attached to the covers to be sure of the measurements. For the Hidden Hinge Binding System piece make your first score mark at 1.5 inches then do this pattern - 1/2inch 1/2inch 1/4inch 1/2inch 1/2inch 1/4inch 1/2inch 1/2inch 1/4inch 1/2inch 1/2inch 1/4inch 1/2inch 1/2inch leave a 1.5 inch flap and trim off the excess. You need to glue the 1/2 inch sections to each other, this will form the flap you attach your pages to, leaving the 14 inch sections with no glue on. Once glued together fold the flaps in each direction to ensure easy turning once the pages are attached. Attach a cover piece to each 1.5 inch piece ensuring the line up with each other. Then apply glue over the inside surface of the cover and attach the other 2 cover pieces on top with the 1.5 inch flap sandwiched in the middle. This will give stronger bond for the binding and a thicker cover. Note my flap is smaller in the second pic due to a error I made on that side. Now for the spine. Measure the finished width of your binding and covers and add 1 inch cut a piece of scrap the the height of the covers and this measurement your just made. Score .5 inch in from each side. Apply glue to the spine, attach the .5 inch flaps to your covers and the middle part to your binding. You will need to press the various spaces together until things are holding well. Set aside to dry. Now work on your pages (toilet rolls) measure the length of the rolls and the width, double the width and add 1/2 inches. Cut papers to these measurements. Apply glue to the back of the paper, lie them down glue side up, put the toilet roll in the middle, fold the top and bottom of the papers over the toilet roll to cover. Repeat for all 5. 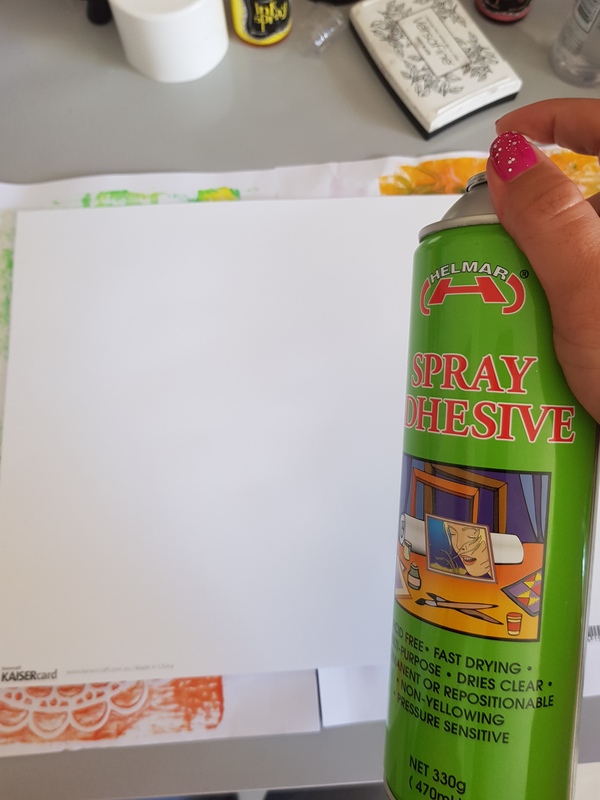 Once your cover is dry, cut papers chosen for the covers a 1/4 inch smaller than the cover and adhere with Helmars Professional Acid Free Glue. Make sure you are working on the outside of your covers when using what you want to be your cover, I got muddled and my front cover became my inside of the back cover. Use the Lace or Ribbon you have chosen to cover the spine, adhering with Helmars Professional Acid Free Glue, this helped strengthen my spine. Attach pages to your binding starting with the last page and working forward, by applying glue to both sides of the binding flap and sliding the page over the flap, apply pressure for a few moments until it is holding well. Decorate covers and pages with printed embellishments, alphas, Earth patch and burlap trims. Insert tags into your pages. Now your album is ready to add photos and journaling! HI all, it's Bridget here again. This week I am up-cycling a box my new wallet came in, into a gift box. To start with be sure your box is clean and dust free. Then I lay the box on top of the scrapbook paper and used it as a guide to measure out where to cut the scrapbook paper to wrap around the box. Once cut out use a brush (my children just did a art project so all my brushes have vanished and I was left with this one) and apply Helmar Decoupage Paste. Place the box back on the paper and wrap the box. Take your time with the corners. I like to then use the Helmar Decoupage glue as a top coat, it gives a lovely shine to the paper. After this has dried, using a stencil add some texture paste. I was going to paint my chipboard white, but decided I liked the natural look with this paper. Helmar 450 Quick dry Adhesive is perfect to add this to my box. I also used Helmars 450 Quick Dry Adhesive to add my other embellishments. Here is my finished gift box. I filled mine with roses chocolates. I think its a lovely way to say "Thank you" and has much more meaning than just buying a box of chocolates from the shops. Also it is great for the environment, one less box in the recycling bin. Have you made anything out of a box headed for the recycling bin? I would love to see! Until next time, Happy crafting! Hello, Lydia back today to share another project. Today I am sharing a scrapbooking layout. First thing I did was cut down the die cut 12x12 sheet to roughly 4x12 so be placed along the right side of the layout. I then traced some of the chosen hearts onto the patterned paper and fussy cut them so they could be adhered using Helmar 450 Quick Dry Adhesive to the back of the heart die cut sheet. Next I picked my photo and adhered again using Helmar 450 Quick Dry to a piece of patterned scrapbooking paper and a paper doily. Then came the fun part of playing around with embellishments, which included fussy cutting butterflies from pattered paper, flairs, enamel dots and much more. So that is my project/layout. I hope enjoyed and I will see you back soon with another project. Jean here and today I have a fun project for you and the kids! Do you like to explore - trying to see the birds that have returned, checking out the flowers that are starting to bloom, or maybe you are watching the chipmunks running around the yard. All explorers need equipment and one of those is a pair of binoculars! I have a fun way to make a pair. First you need to get your materials. I used pattern paper but you could use you construction paper which the kids can decorate! You also need 2 toilet paper rolls and your favorite Helmar Glue. This time I used my Craft and Hobby PVA glue. Cut your paper into two 6 inch by 4 inch pieces and glue to the toilet paper rolls using the Craft and Hobby Glue. I put glue on both the paper and the toilet paper roll. I secured the ends with paper clips until dry. The rolls can be decorated using stickers, ribbon, or by coloring. Once decorated, glue them together. Punch holes on the outside and add a ribbon or string. You are now ready to explore! I was spying on a bird at the feeder! I hope you give this fun project a try! Spring is a great time for exploring and everyone needs a pair of binoculars! Hi Everyone, its Bridget here again and I want to show you a scrapbooking layout I have done. As part of my daughters end of year performance she performed Yellow Submarine. You will be singing that all day long! First thing I do is splash on some watercolor. Then with a stencil, add some moulding paste. This is great for texture!! I like to add some stamping for some extra texture, for this layout I used a grid clear stamp. For a extra effect I added some watercolor drips. Now I am happy with my background and it is dry, it is tie to add my photo. I love using scrapdots. I love the height they give your scrap booking page lots of dimension. To add height just add more scrapdots and dont push hard as this will flatten them. 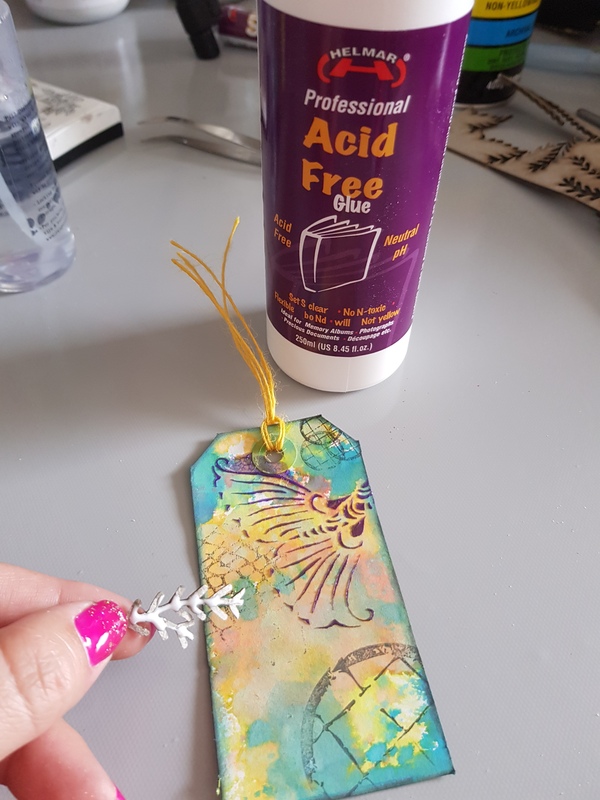 Professional Acid free glue is great for adding embellishments, especially if they are close to the photo. The photo will be protected. For those fiddly bits, I like to use Helmars 450 quick dry glue. It drys nice and quick so you dont need to worry about them slipping out of place on the wet glue. Once again here is the finished layout. Thank you for joining me again, Happy crafting!